To promote the quality of the Visa, Citroen asigned Guy Verrier to establish a ‘Total Trophée Visa International’ competition in 1981 with Group V Visa’s. This was to search for drivers to be chosen for the 1982 season. With this competition Citroën invited some companies to create a car using the Visa Super X as the basis. Eventually a design was choosen that looked very much like the normal car and was very easy to service. This redesign was named the Visa Trophée. The engine of the Super X was enlarged to 1299 cc, fitted with 2 carburettors. It produced in this form 100-150 bhp. On 1 January 1982, the Trophée was homologated as for Group B (class up to 1300cc). The Trophée was a great success and won many rallies. Like normal production VISAs, it had front wheel drive and was a great hit not only in France but also in the UK where it was used successfully and in Holland where the Dutch dealer team won a lot of victories with this car. (They had 2). Starting with about 100hp out of a 1299cc engine the tuning of the car kept evolving until the end where the engine developed over 150hp from this fragile small block. One of the prototypes for the Trophée was designed by Lotus. Guy Verrier introduced a new formula every year. In 1984, the Citroën-Total-Michelin Women’s Trophy attracted thousands of women. The Marque competed in Kenya, Mille Lacs, San Remo and Monte Carlo. Chrono is a limited series based on the Visa Trophy. The four wheel drive Visa Mille Pistes was meant as a follow-up to the succesfull Trophée Visa International. Meaning “1000 Tracks”?? 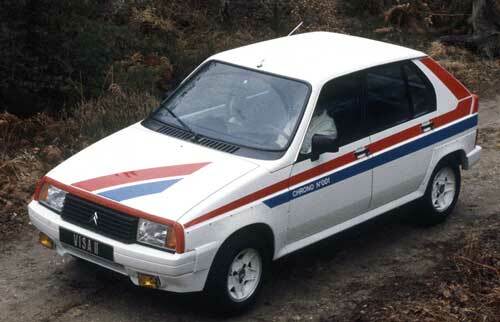 Citroën released the Mille Pistes at the end 1983 as a Group B car, and 200 were built. The car was based on the GT Tonic but with four wheel drive. (1360cc 80hp), but with 4 carburettors instead of 2. This engine was tuned to 112hp which increased as the cars evolved. 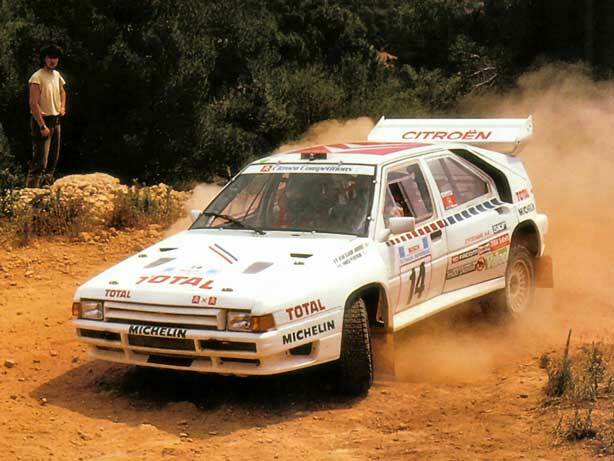 Two round headlights, extended wings, and a special badge in the grille: two Citroen chevrons with an ‘X’ in between to indicate the four-wheel drive.The Mille Pistes was even more succesfull than the Trophée and remained competative until the mid 1990s. 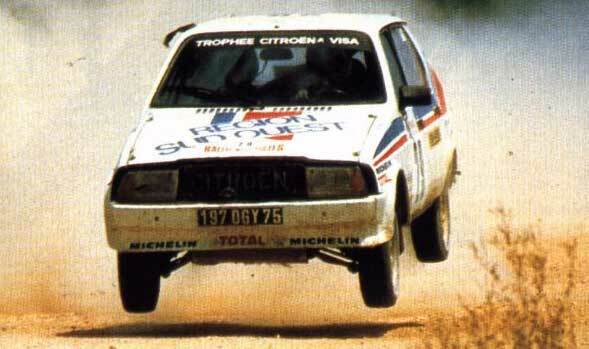 Although rarely remembered, the Citroën BX 4TC was the pinacle of Citroën’s group B efforts. It was based on a similar concept to the Audi Quattro, in that it had a front-engine, monocoque chassis design. The BX 4TC could have been successful had it been introduced earlier, but because it was introduced in 1986, it was outclassed by competitors with space frames, mid-engine layouts and a several year development advantage. The BX 4TC competed in one world championship rally, suffered three mechanical failures, was rolled back onto the boat, and was never seen again in world rally competition. Citroën built 20 of these Evolution BX 4TC’s in the Citroën Competition workshop at Trappes. Technical father Guy Verrier developed this car using only Citroen parts, elements and mechanics. The 4TC EVO has basicly the same engine as the 4TC, only differences are the turbo-compressor (KKK type K26) at 18psi of boost. The engine reved to a maximum of 8000 rpm, maximum power of 380 bhp and 7000 rpm and maximum torque 253ft/lbs. at 5500 rpm. 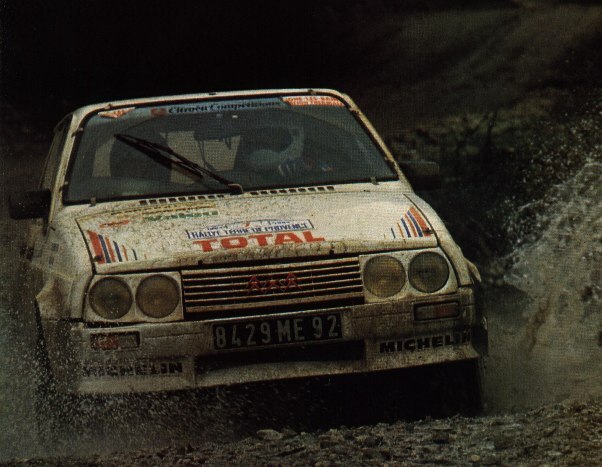 Drivers Jean-Claude Andruet and Phillipe Wambergue performed development tests piloted the BX 4TC’s in rallies. The car however would only compete in 15 rallies, of which only 3 where FISA WRC events (Monte Carlo, Portugal and the Acropolis Rally). It retired in 13 of the 15 rallies. With the exeception of two models which were saved (in the Citroen and Hommel collections) the 18 others were probably destroyed. However at least three bodyshells managed to escape the hands of the breakers. Two of them were recovered by amateur driver P. Pivert who after great efforts was able to rebuild one Evolution model in 1989. This car was later destroyed in a violent crash, remainings of this car were used to build up the second bodyshell, which should still be alive. The third bodyshell was for sale (very discreetly) in a garage in the Paris area in 1992. One of the very few pictures from the Citroën collection in some very secret hall closed for public. 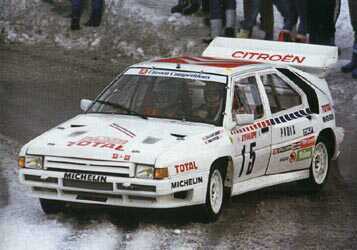 Citroën seems to have kept at least 1 BX 16 valve touring car, 1 BX 4TC EVO and 1 ‘ordinary’ BX 4TC.